I have been so concerned with the posts I have been reading and listening to talk of some teachers! STANDARDS! PARENTS! BEHAVIOR! The negativity that seems like venting makes teachers seem like they don't love their jobs! Check out Greg Smedley-Warren's bog and take the challenge! Take a few minutes, smile and talk to your students! Listen to them talk and interact! Stop overly obsessing about standards and/or data and focus on the learning of your students! Proclaim and broadcast it! Plan something fun! After, 25+ years of teaching...they only remember the fun stuff! Like the time you fell off the cooler at the field trip! 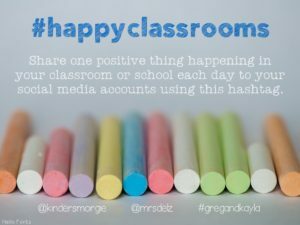 Promote other teachers that you see and hear creating "happy" classrooms! Debora......I so agree! I have to admit that I sometimes find myself falling into the trap of fretting over data, testing, etc. Those are the days that I have to remember to step back.....breathe......close my door and just teach. All of the new requirements of teachers can feel so overwhelming at times but those days when you do something fun and creative are when the real learning takes place. Thanks for the post.....I'm your newest follower! Thanks! Just teach and have fun! Hoping we all remember daily! Thanks for this post! I agree also. On our team we use laughter to remind ourselves how much we actually LOVE our jobs. We "allow" the occasional vent... and then we support ourselves and move on. We are the loudest wing in our school and it is usually due to belly laughs!! SO great to have that support! You are lucky! I love that you posted this. This time of the year can be extra challenging with managing behavior, end of the year, etc. etc.! Just enjoy, Lisa! Time goes way to fast! Great post! Negativity and Positivity are both contagious. We decide which one to spread! Love these ideas - I'm going to take some into my classroom. Thank you teachers. Thank you for all you do. Thank you for educating and inspiring our future. Thank you for spending your entire day loving and protecting our children. Thank you for spending your own hard earned money to make your classroom a fun and productive environment to educate. Thank you for giving up your time on nights and weekends volunteering for extra-cirricular activities and lesson planning. YOU are super!! YOU are heros!! You are SUPERHEROS!!! Thanks, Jason! Thanks for for the support! Only someone that lives with a teacher understands!